A brief history of Cheshire Demolition and Excavation Contractors Ltd.
Brothers Phil & Stan started ‘Swindells Bros’ carrying out building work and demolition from their family farm in Bosley. Bought an acre of land on Moss Lane, Macclesfield, became a limited company & changed their trading name to Cheshire Demolition & Excavation Contractors Ltd.
Neil Trueman joined the team and became a director. Became suppliers of recycled aggregates after introducing a crusher and screener. 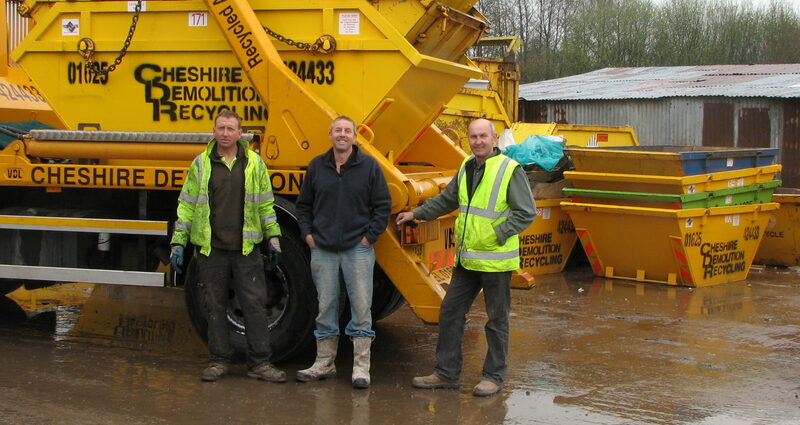 Introduced skip hire throughout the Cheshire East and South Manchester area. Erected a waste transfer station after growing requirements to reduce and recycle waste rather than sending to landfill. We installed a waste picking station for the quick & efficient manual sorting of waste that comes in to the yard. Purchased a reclamation yard which runs adjacent to our yard, increasing our site area to over 4 acres. Stan is the estimator and is also in charge of strategy and planning. Phil is in charge of building and development and provides on site team support. Neil is the contracts manager and deals with plant hire and the day to day running of our wagons.